Hundred Posts on Nippaku: Time for Celebration! my first blog post To Start With Me now: *Reading what I wrote as an 18-year old and thinking “how cute”*. the most fun post to work on For The Land of Chocolate and Beer, I actually ventured out to Bruges and interviewed Japanese tourists on the street! your favorite blog post Living in Japan: Pros and Cons I guess this one is a very down-to-earth description of my experiences living in Japan that appeals to those who want to know more about daily life over there. 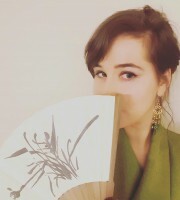 my favorite blog post Haiku with a Cup of Tea I enjoy translating poetry or literature, showcasing my creativity and doing research, and in this post I could do all of that! I would love to do something similar in the future. the blog post most commented upon Japanologie aan de KU Leuven: wat houdt dat nu precies in? My only post in Dutch, meant as a practical guide for students with questions about my university’s Japanese Studies program. I still receive questions about this post from time to time and am very pleased to hear that so many people are interested in studying Japanese! The biggest surprise I had two big surprises, actually. The first time was when I reviewed a documentary on Tokaido and received a “thank you” from the director himself, the second time was when a Japanese professor whose work I had referred to throughout my master’s thesis commented under “about” on my post about Iwakura and Gheel! These comments really boosted my confidence. And now, time to celebrate my hundredth post! This wouldn’t be Nippaku if I didn’t write something informative about Japan, so let’s examine – very shortly, I promise – how celebrations are held over there. There exist many festivals in Japan, often rooted in religious traditions. Apart from these, the Japanese also like a good party, although a very different one from the parties I am used to at home. And then you have the “imported” stuff like Christmas, festive occasions that have been adapted by and hybridized into Japanese culture, hence developing its own unique Japanese traditions. Some festivals have their roots in Chinese customs but were “imported” centuries ago, and underwent a lot of changes since then. Other festivals are local celebrations that developed out of religious observations and are connected to a certain town, district or even ward, always linked to a Shintoist shrine or Buddhist temple. During my time in Japan, I witnessed nationwide celebrations such as Tanabata 七夕, Obon お盆 and New Year’s Day (oshōgatsu お正月), and around three matsuri in Kobe. I took pictures, but the quality is a little crappy, so if you’re looking for some great photos with explanation of the most popular festivals in Japan, I recommend you this site. A typical local matsuri, annually held and dedicated to the local shrine or temple, is organized by the neighborhood’s community and involves a considerable investment of time and money. Apparently, a matsuri expresses the unity of men and deities and offers a means to purify oneself, but functions at the same time as an opportunity to display power, status, friendship and a sense of community. Above all, festivals are social events: the festivities are always preceded by ritual offerings to the shrine, besides donations, yet this part of the festival is the least frequented by the party-goers. One religious element, however, featuring as the central piece of the evening is the omikoshi お神輿, a shrine, palanquins or float, which is carried through the streets by locals dressed in a similar uniform, usually a happi coat (法被) of some kind. The shrine bearers chant wasshoi with every step they take: wasshoi actually refers to the expression wa wo shou 和を背負う, “carrying peace/harmony on one’s shoulders”. The chanting is accompanied by upbeat traditional music and synchronized dancing. Sometimes, festivals feature parades with lots of cute mascots dancing around. For the entertainment part of the matsuri, there are food stalls as well as games for the kids (and adults with a young spirit). During summer, fireworks will – literally and figuratively – be the highlight of the evening. This type of festival actually resembles what we call “kermis” in Dutch. And of course, you cannot leave a festival without having tried lots of different foods: typical for matsuri are stalls (屋台) that sell taiyaki タイ焼き (fish-shaped fried batter stuffed with sweet bean paste, chocolate or custard), yakisoba 焼きそば (fried noodles with toppings), kakikoori かき氷(shaved ice with colorful syrup) and other yummy snacks. Look how happy I am eating a slice of pineapple covered in chocolate. Of course, the Japanese also celebrate Western holidays such as Christmas and Valentine’s Day, albeit in their own way. These celebrations are no public holidays, so people go to work or school as usual that day. But that doesn’t make these holidays less special. I have always found it fascinating how the Christmas tradition has taken shape in Japanese society (of course there is equally much debate on the true meaning of “Christmas” nowadays in the West) and I am ready to baffle you with some amusing facts on this topic. Did you know that the Japanese “traditionally” eat a bucket of Kentucky Fried Chicken, followed by a strawberry sponge cake with whipped cream? KFC played it really smart when they launched their “Christmas Chicken” campaign back in 1974 (turkey is difficult to come by in Japan), and due to the success of their advertisements, fried chicken became the standard meal that every Japanese wants to eat on Christmas. You have to pre-order your bucket weeks in advance! Moreover, Christmas is a day to be spent with lovers. So, for taking your loved one on a date, Christmas would be the most romantic time – restaurants and hotels are fully booked as well. It is no surprise, then, that stores sell tons of expensive jewelry and clothing as Christmas gifts. This was all new for me, since there is not much romance going on during my Christmas Eve, which I spend at home with my family like many other Belgians. KFC “Party Barrels” for Christmas, now open for reservation. So what about Valentine’s Day, the day people in the West consider to be the most romantic one of all days? The Japanese celebrate it with a lot of chocolate. Not only do they buy or make chocolate for friends and family, they also give giri choko 義理チョコ(“obligatory chocolate”) to co-workers and bosses. But careful! On Valentine’s Day, only women give chocolate to men. Among school girls, there is also a tradition of “confessing one’s love” (告白 kokuhaku) – everyone who has ever read or watched anime/manga will probably be familiar with this phenomenon. Men can reciprocate with a present a month after that, on White Day, but this is not necessarily white chocolate (anything white and girly will do, even lingerie). The introduction of Valentine’s Day and its male counterpart White Day should be understood against the backdrop of succesful commercial attempts to increase sales in post-War Japan: Feb 14th was promoted by a chocolate manufacturer, White Day (originally called “Marshmallow Day”, but this name didn’t catch on) was introduced by the National Confectionery Industry Association. Hence, “extravagant consumption” and gift-giving is a good way to describe Japanese people’s activities during these holidays. On a more personal level, you have the birthday celebrations, welcome and goodbye parties and so on. I must confess that I was not a huge fan of the big parties I attended, despite all the organization that went into it (sorry, my Japanese friends). In the first place, these parties start really early, around 5pm (I am used to parties that start from 10pm or later), but there is also food (not only snacks! ), so it could be something like an early dinner party. You are expected to come at 5pm sharp and not just drop in at whatever time you like, and when the schedule says the party is over (for example around 8pm), then it’s really over and everyone just starts to clean up. The problem was that when I had some alcoholic drinks, I would be pretty worthless and unproductive for the rest of the evening so I would have preferred to go out after I had finished my daily tasks (I usually study until late at night). Playing games was fun, though. Notice the name tag and the front desk in the left corner? About this “schedule” I mentioned, I mean that there was some kind of program that was announced beforehand: something like 5pm arrival and speeches / 5.15pm conversation game / 6pm dance choreography / 6.30pm bingo / 7.30pm group picture / 8pm clean up and leave. The problem I had with these kind of Japanese parties is that it did not allow for being spontaneous. You were forced to get to know other people (there was some kind of game) and enjoy yourselves through these organized activities, as if you wouldn’t manage to do so otherwise. But maybe I’m just a little picky when it comes to partying, because not all parties were like that. I remember one “wine party” with the research department, apparently a tradition of the faculty to celebrate the Beaujoulais Nouveau Day in Japan. We could casually converse, eat and – above all – drink wine, without keeping to a schedule which was really fun! When somebody burst out into a dance, it was a spontaneous move (yes that happened). It was also nice to have some parties in the international dormitory where I lived. We had our Christmas party there, birthday parties and my goodbye party. Another type of party is nomikai 飲み会 (“drinking party”) or konpa in a university context. Nomikai do not always celebrate something, but are often held at the end of the semester, for example, in an izakaya (Japanese pub) with an “all you can drink and eat” formula, and exist for the sake of deepening friendship bonds or strengthening work relations. I had several nomikai with the Shorinji Martial Arts Club that I joined, with co-workers and with friends. You could say that for me, it was more like a tabekai (“eating party”) since my love for food has no boundaries and I wasn’t a big fan of getting myself so drunk that I couldn’t walk properly anymore (sadly, many Japanese students are in this state after a nomikai). Anyway, I hope that I have proven to you that Japanese people like to party and celebrate! Let’s do this again when I have written my 200th post. This entry was posted in culture, society, Uncategorized and tagged blogging, celebration, festival, japan, party by Nippaku. Bookmark the permalink. Animating us for 100 times now, well done and congratulations to you Ann-Sofie! You may celebrate now (on your favorite way of course…)!